Three former United State of America leaders have spoken on Sen. John McCain, 80, who has just been diagnosed with a primary glioblastoma, a type of brain tumor. 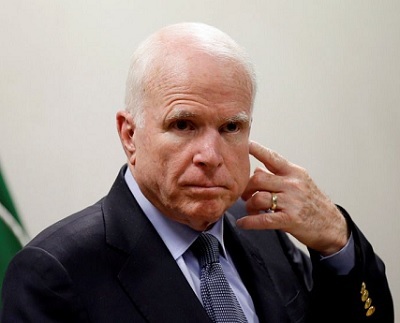 McCain brain tumor diagnosis was confirmed by Mayo Clinic doctors directly involved in the senator's care, report according to CNN established. The doctors spoke directly to CNN Chief Medical Correspondent, Dr. Sanjay Gupta. The senator underwent surgery to remove a blood clot on Friday at Mayo Clinic Hospital in Phoenix. Lab results from that surgery confirmed the presence of brain cancer associated with the blood clot. Former US President, Bill Clinton took to his twitter handle @billclinton and said; "As he’s shown his entire life, don’t bet against John McCain. Best wishes to him for a swift recovery"
His wife Hillary said @@HillaryClinton said, "ohn McCain is as tough as they come. Thinking of John, Cindy, their wonderful children, & their whole family tonight"
CNN report says Glioblastoma is a particularly aggressive tumor that forms in the tissue of the brain and spinal cord, according to the American Brain Tumor Association. A pathologist was in the operating room during the procedure, a minimally invasive craniotomy with an eyebrow incision, said his doctor, who added that the surgery lasted about three to four hours. Post-surgical brain scans show the tissue causing concern has been completely removed.